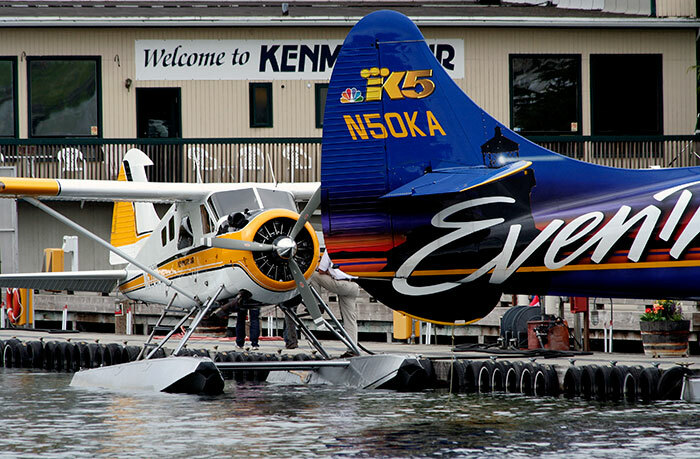 Kenmore Air was established in 1946 at Kenmore, Lake Washington, and has grown into one of the largest floatplane operators in the world. Its passenger terminal on South Lake Union in Seattle is a main hub for scheduled and charter flights across the American and Canadian northwest. 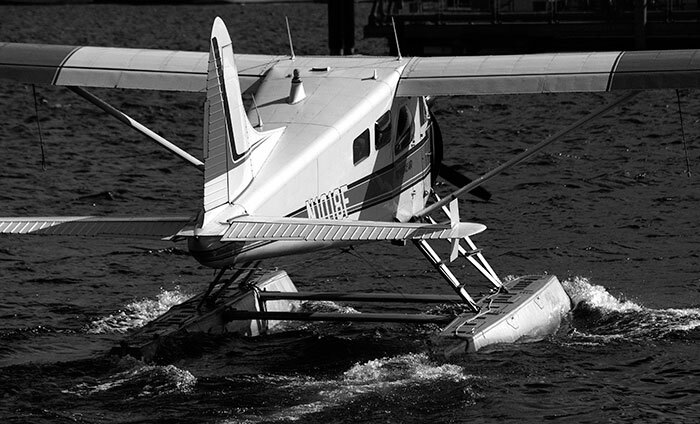 This image shows two of its principal floatplane types moored at the dock; the ten seat de Havilland Turbo Otter and the seven seat piston engine de Havilland Beaver. 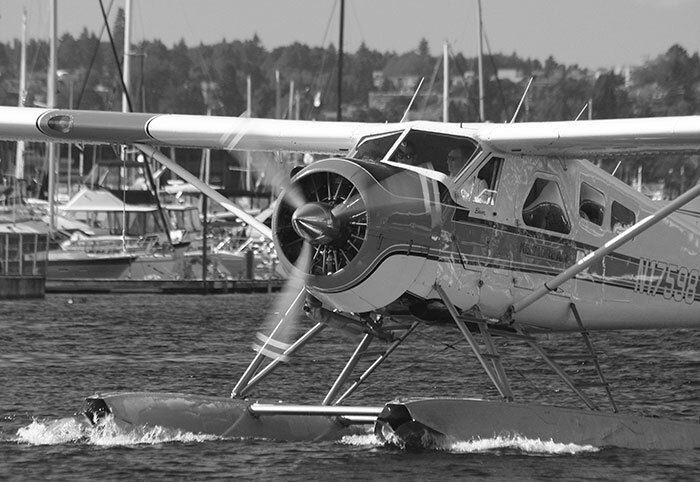 The Beaver first flew in 1947, the year after Kenmore Air began operations. 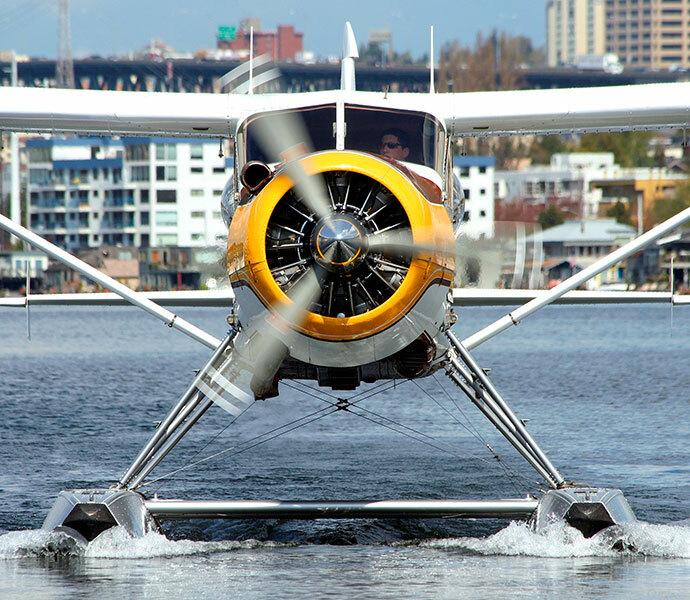 It's a rugged machine that is easy to operate and capable of flying from land or water in all manner of terrain – a bush 'plane. Some sixteen hundred had been built when production ceased in 1967. The second is a turbine powered conversion that improves on the performance of its radial piston engine neighbour. An Otter brings up the rear of the line. 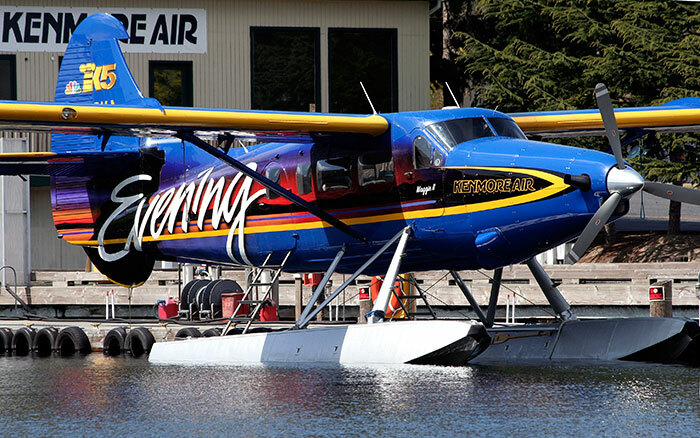 Kenmore Air operates a very successful floatplane rebuild programme. 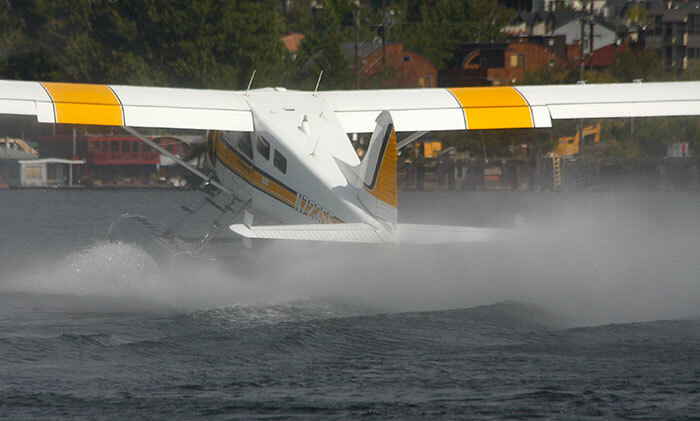 This Beaver taxis away from the dock in late afternoon sunshine to make an almost immediate northerly turn to accelerate across the water to take-off speed. Lake Union is comparatively small and its shores are lined with houseboats, social and commercial boat moorings and working ship building and repair yards. The 'planes operate from a central strip and when flying out north head towards Gasworks Park. There are several vantage points from which to watch and photograph Kenmore Air activity other than alongside its terminal. Lake Union Park is across a narrow inlet and houses the Museum of History Industry in its open spaces and preserved ships are moored alongside. Close alongside is the Center for Small Boats that provides moorings for the operation and rebuilding of small historic craft. This image was made from the end of one of its pontoons. As the pilot opens the throttle the Beaver's tail settles as bow-waves build under the floats and slipstream from the propeller whips up the spray from the wave tops. For spectator and passenger alike this must be the most interesting stage in getting into the air. Taking photographs of the rapidly receding 'plane is interesting too but also means that the camera does most of the seeing. Metering for the 'planes' white paint can create some dark backgrounds, especially in monochrome. As in the second image, I cropped out this narrow composition to concentrate on the machine itself. The multiplicity of forms, colours and textures in the background can be problematical but black and white can bring visual harmony. Landings are easier to photograph as the 'plane advances into the viewfinder. Sometimes the line of flight heads directly to the lens and burst shooting gives a series of expanding images. Taxi speeds vary but this must have been the fastest I've seen as the pilot sharply accelerated down the lake. Many of the flight operations run north to south but are sometimes reversed. The current extensive redevelopment between Lake Union and the city centre has restrictions on building height to allow for landing approaches from the south. 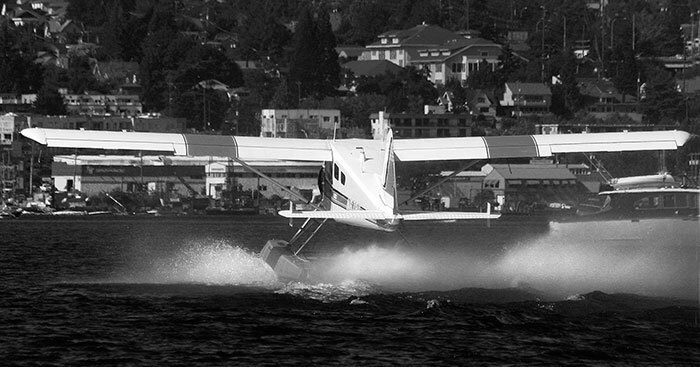 Floatplanes overhead are an everyday part of city life. 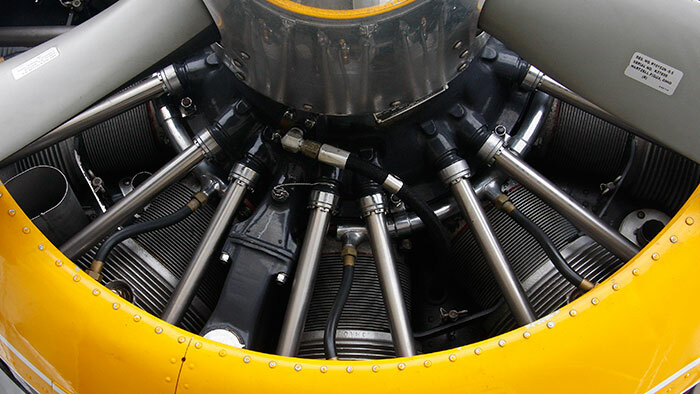 I like this square shot that displays the elegant Beaver engineering and the nine-cylinder Pratt & Whitney Wasp Junior engine that generates 450 horsepower and a beautiful sound. 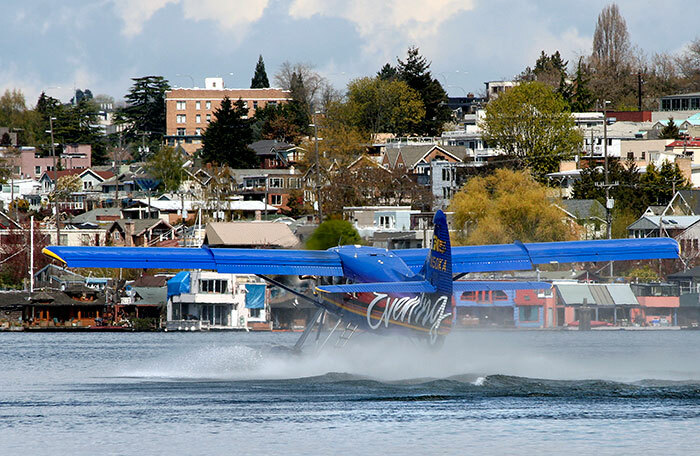 The airline's Kenmore engineering base is at the northern tip of Lake Washington and is its original home. Flying out from there has the added interest of aircraft to be seen on the water, on land and in the maintenance and rebuilding workshops. Quoting Beavers, the Kenmore Air website notes that "….. our remanufacturing team turns them out better than new". 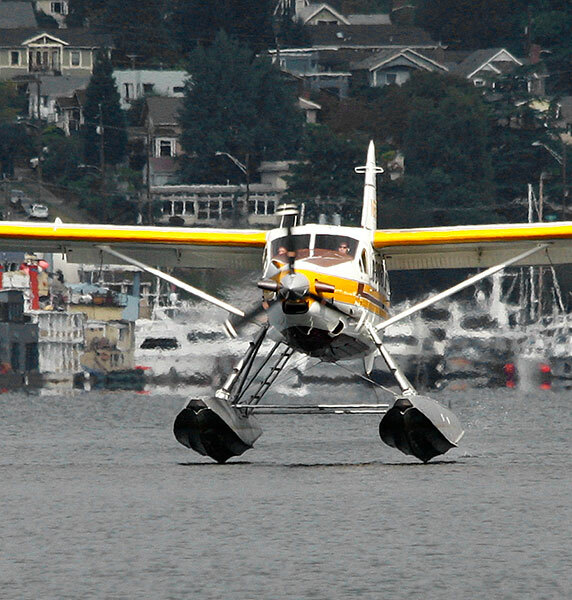 This Beaver taxied close by in the final yards of its run from touch-down to the jetty mooring. Where no assistance is available the pilot does the work himself at either end of the flight. After seeing the passengers on board he casts off, nudges the 'plane into gentle motion, then steps on to the float and up the ladder to the cockpit to start the engine and head out. As ever on Lake Union, moored boats form the backdrop. Named and painted out for a local broadcast company I gather that this de Havilland Otter first flew in 1956. A 750 horsepower Pratt & Whitney turbine was fitted in a rebuild. The aircraft and its striking paint scheme seem always to be immaculate. 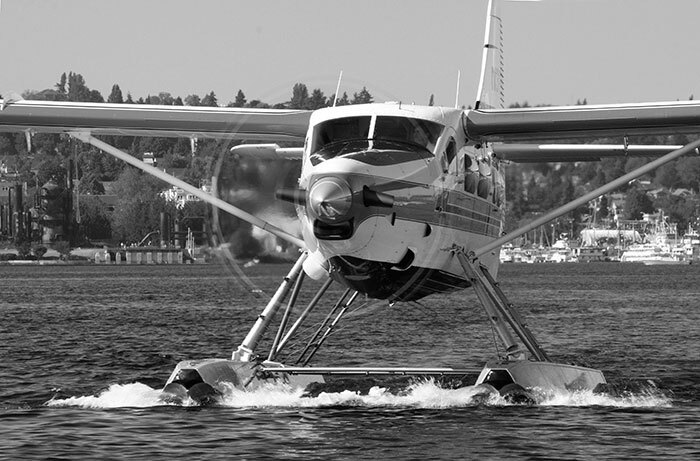 The engine note is markedly different from the Beaver and as a passenger is not as hard on one's hearing: earplugs are issued on Beaver flights. 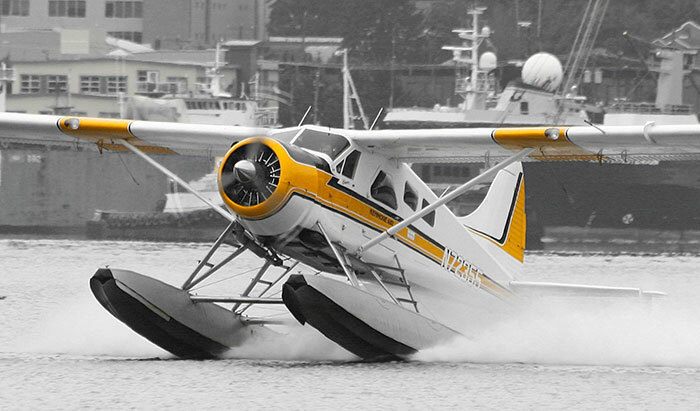 I have no ideas as to the differences in take-off performance but the Otter with ten passengers flies faster than the Beaver with seven. Having flown in both I prefer the smaller 'plane. 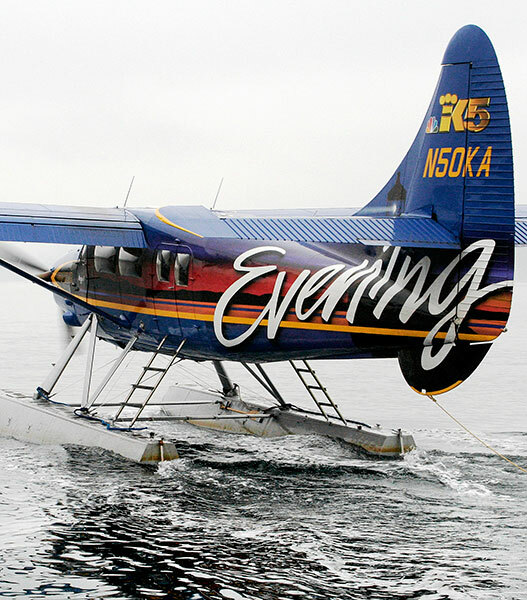 I flew from Lake Union to Friday Harbour in this Otter following a departure delayed by early morning fog around the San Juan Islands. After disembarking and boarding passengers the pilot headed out into the thinning mist. I suppose that the same viewpoints do lend some repetition to the compositions but there are always detailed variations. 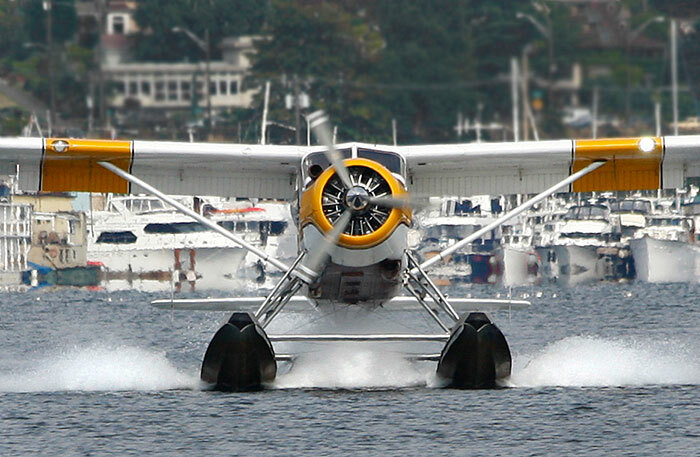 Like the Beaver in 09, this stern shot details the struts and boarding ladders linking the fuselage and floats. 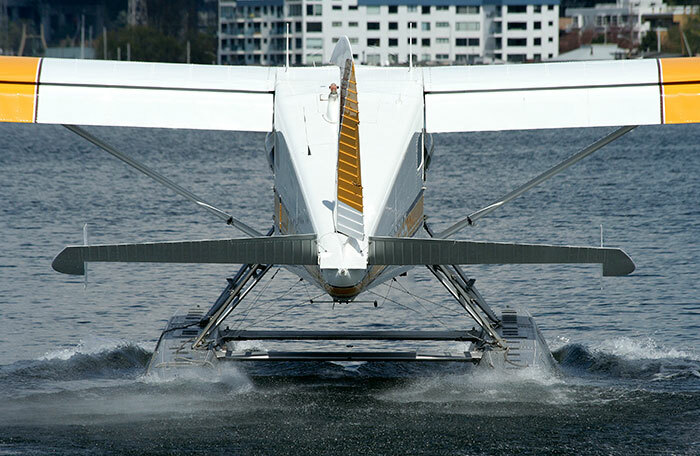 The rope trailing from the under-fin is used to manoeuvre the 'plane at the jetty. One Otter started its take-off further down the lake than usual and unusually I was able to shoot from the side rather than behind. It shows that this is a larger aircraft than the Beaver. 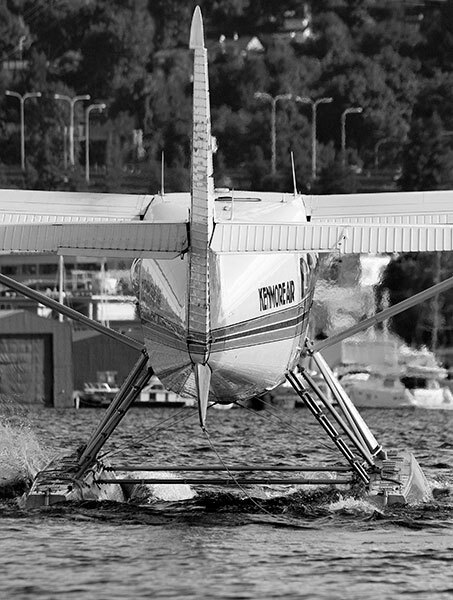 Water-borne flights in the latter with a handful of fellow passengers surely recreates the early and more exciting days of air travel. This image is one from a burst shooting that caught the floats as they were almost touching the water surface. I have spent only a few hours by Lake Union on each of several visits to Seattle but my interest does not wane. A relaxed camera session at the Kenmore base would be welcome. I have taken a few photographs at Kenmore and have been disappointed with most of them. This is a crop from one showing the lower cylinders of the engine in a pristine Beaver rebuild sitting on its floats outside one of the workshops.